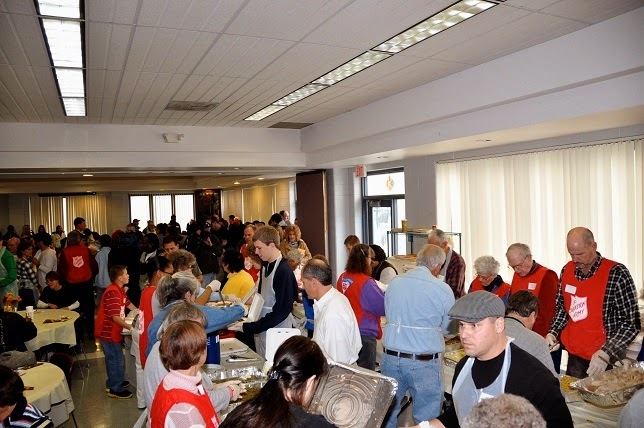 KANSAS CITY, KAN. – A longtime Kansas City holiday tradition returns next week when The Salvation Army hosts its annual Community Thanksgiving Day Dinner. The dinner, which is open and free to the public, will be held at The Salvation Army Linwood Center, located at 101 W. Linwood in Kansas City, Missouri, Thursday, November 27 from 11 a.m. to 1 p.m. The meal will include turkey and all the trimmings. More than 120 volunteers will assist with the on-site Thanksgiving Dinner from set-up to clean-up and 500-600 people are expected to attend. Also on Thanksgiving Day, 125 volunteer drivers for The Salvation Army will deliver carry-out Thanksgiving meals to nearly 1,000 homebound and elderly individuals in the metro area. All volunteer opportunities for the Thanksgiving Day Dinner are closed, however please check online for other holiday volunteer opportunities at www.ringkc.com.